Bear Chat: Vengeance is fun! Firstly if you haven't been keeping up with Bears (and tanking in general), Blizzard introduced a new mechanic to help tanks steadily build up threat throughout a fight. The intention of said ability, Vengeance, was to help make sure DPS didn't start to creep up on you as the fight progressed. It's not really intended to help too much with snap/initial aggro, but of course since it's a buff that increases every time you take damage and diminishes when you don't take damage it is possible to have some amount of vengeance increased AP when a new mob spawns or you pull the next pack. It's interesting the kind of numbers you see from your abilities when your Attack Power gets to this level. Mangles start hitting for well over 20,000! 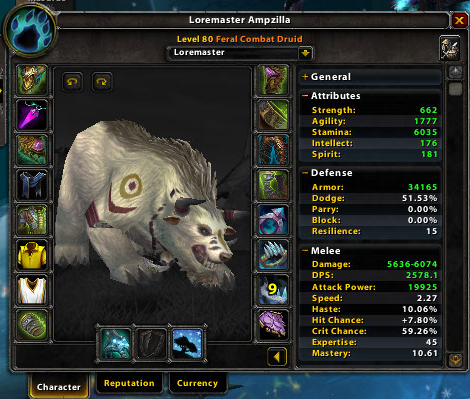 It adds a whole new element of fun to tanking, and with this new range of damage and the other changes for bears it's been an amusing pre-expansion patch. Also like I mentioned above, vengeance can be used for more than just keeping your lead late in an encounter on the main target, it's also useful if you need to pick up new adds. A great example of this (and one I hope to illustrate by either picture or a short video later) is with Faerie Fire(Feral). I've been designated as "add" tank for Phase 1 of the fight and nothing snaps ghoul aggro from cleaving DPS like a 6.5k FFF.